Order Quest Mega 8 Biotix 30 caps from the Online Health Food Store UK. Buy Quest Mega 8 Biotix - 30 capsules and other quality Digestive Aids safely online in the UK. Quest Mega 8 Biotix 30 billion active organisms. A high potency supplement containing 8 strains of lactobacilli bacteria. A high potency supplement containing 8 strains of lactobacilli bacteria. 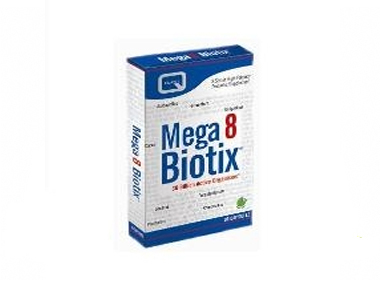 Mega 8 Biotix is a high potency supplement containing a blend of 30 billion lactobacilli bacteria including; L. fermentum , L. gasseri, L. bulgaricus, L. paraplantarum, L.plantarum, L. casei, L. rhamnosus and L. acidophilus. Maltodextrin, capsule shelll (hydroxypropylmethyllose, gelling agent: gellan gum), lyophilised lactobacilli culture, magnesium stearate, antioxidant: ascorbic acid. Free from animal substances, artificial preservatives, colours or flavours, added sucrose, lactose, salt, yeast, wheat and gluten. One or two capsules daily, with or after a meal. Swallow with water. Do not exceed recommended intake. As official Quest stockist in the UK, we sell quality Digestive Aids to customers throughout the UK in England, Wales, Scotland and Northern-Ireland. View more products on the Online Health Food Store from Quest. Where to buy Quest Mega 8 Biotix 30 caps safely online? Shop at the Online Health Food Store if you are wondering where you can buy Quest Mega 8 Biotix - 30 capsules safely online in the United Kingdom. Our Health Shop is located in the UK and our award-winning independent has been serving customers in England, Wales, Scotland and Northern-Ireland since 1976. You can buy our Acidophilus & Garlic supplements and other quality Digestive Aids online and we post out orders to any UK address. Mega 8 Biotix 30 caps - Quest Mega 8 Biotix - 30 capsules in Digestive Aids and Herbal Remedies, Tinctures & Supplements.